In my Thanksgiving edition on my blog, I wanted to talk about things that I am Thankful for and how the Black Friday rush is very pertinent to Information Security. This has been a great year in my life. I had an awesome year filled with friends, family, and opportunities. I had two great semesters at Syracuse, the summer of my life at the NHL, and an overall wonderful life. There are not many things that I am able to complain about this year and I am thankful for that. 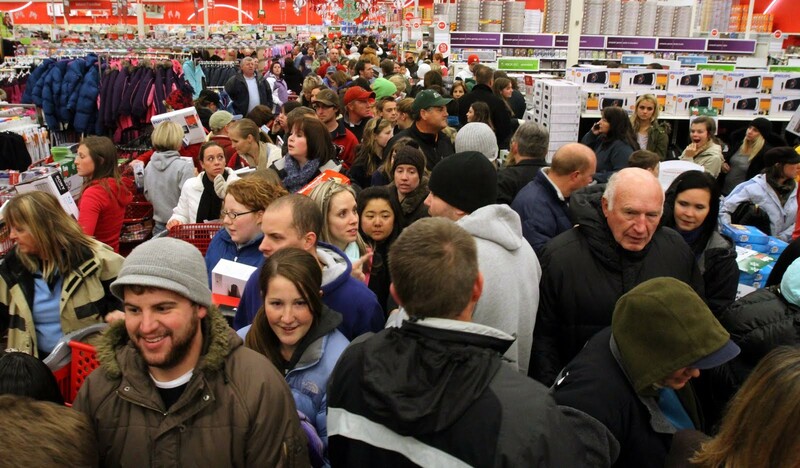 This is a picture of a Target on Black Friday. I love Black Friday, it is possibly one of my favorite days of the year. There are usually a few good deals worth going shopping for, it is such a rush. Stores open up early and the holiday shopping rush begins. I’ve been Black Friday shopping with my Dad for the past 10 years of my life. We wake up at 3 or 4am and drive to wherever we want to go. We wait in line, buy a crazy amount of stuff, fill out rebate forms, and get breakfast after. Over the years, I have noticed some pretty interesting things related to Black Friday. To start, cashiers are in such a frenzy that they never ask for identification of credit cards due to such long lines. This opens up a huge area for fraud. Second, people steal things. Lots of things. I have seen numerous security people tackle grown men briskly walking out of Best Buy because they stole something. Security is probably the most important facet of Black Friday. The biggest thing that is not accounted for is the prospect of identity theft. Imagine thousands of people pushing through a door at one time. How hard would it be for someone to steal a wallet from someone else. This is something I’ve always been wondering about just because I have seen it happen in person. According to SecureGuard report, over 150 million Black Friday shoppers throughout the United States are susceptible to identity theft because they do not safeguard while pushing through the lines. I found this to be an interesting statistic. My advice is to keep doing what you do, just be safer about it. Unfortunately, Black Friday has definitely fallen off over the past few years in my opinion. The deals are not as good and you can easily buy the exact same stuff online for similar prices. You might as well save the gas money. Anyway, I’m going to end my rant and go spend time with my family. Have a happy holiday and I’ll be back next week. ← How Secure are your iOS Apps?